Liquid spills aren’t limited to a specific industry or business type only. Any organization that deals with liquids and chemicals is prone to spills, meaning that they should be well prepared. Spills happen frequently in laboratories, workshops, chemical, and liquid storage companies and various manufacturing sectors. That being said, if your business deals with liquids and chemicals, you must have a fully-equipped and effective spill control system in place to protect against spills in the workplace. Here’s a simple 5-step guide to help you properly prepare. Spill kits are essential tools of spill control systems that help you manage chemical spills. Generally, a kit of this kind will contain absorbents to help you soak up the spills, gloves, and goggles to protect the staff dealing with the spills, bags for containing and collecting the chemicals and a bin to dispose of the chemical waste. 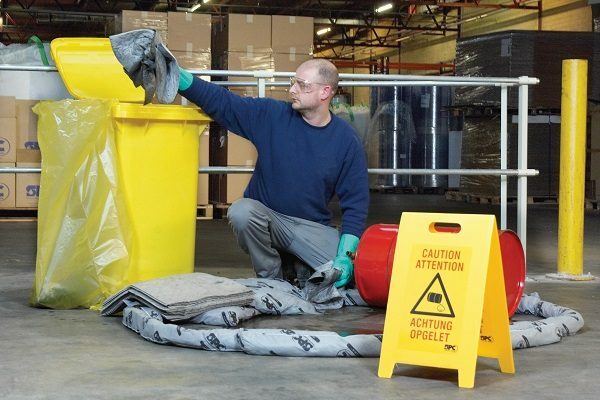 Spill kits are the best first response solution, and every business should include them. Installing the spill kits strategically ensures they are effective. The staff on site should be able to quickly get to the spill kits and deploy them promptly and properly. Ideally, they should be located outside doorways to storage areas, in spots that aren’t obstructed in case a spill occurs, and in spots where they can easily be noticed. Employee training on how to respond to a spill is another integral part of spill control systems. You can have a select few employees who are trained in spill response, but it’s much better if everyone has the knowledge to at least use the spill kits. Additionally, employees should know how to avoid dangers and quickly and completely contain spills. The biggest danger of spills is the release of vapors and toxic fumes that chemicals can release. They can cause breathing difficulties, unconsciousness, inflammation, poisoning, asphyxiation, and other serious injuries. Before you begin a chemical spill containment procedure, check your safety data sheets. If you’re cleaning and contaminating an outdoor spill, always stand upwind. The waste from the spill should be disposed of safely to ensure it doesn’t harm the environment. In fact, Australian standards regarding chemical waste removal are pretty strict and you should abide by them. You can either get a chemical waste removal company to do it for you or use an onsite incinerator. Never dump spill waste into your garbage where you dump other stuff, as it can be harmful not only to the environment but trash collection staff as well.